G’day! 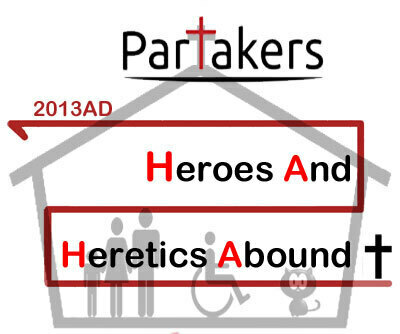 Welcome to Partakers and to our series, HAHA – Heroes and Heretics Abound. Together we are looking at the story of the church from its origins through to the Age of Reasoning in the 18th century. Today we are the eighteenth century and to the last in this series. The 18th century is widely regarded as the ‘Age of Reason’ – the age of scientific discovery. Science was discovering the natural laws that governed the earth. With the advent of the theory of evolution, the idea of a supernatural world was dispensed with. Quickly God had become merely at best an impersonal observer and the supernatural, spiritual worlds and the divine inspiration of Scriptures were being denied. America – In America, there was the Great Awakening! Revival started in 1730 under the passionate and spiritual preaching of Jonathon Edwards. He was followed by George Whitfield, an Englishman who waited for 6 weeks in 1740 and preached to crowds of thousands. Many thousands turned to the church and became Christians during this time of revival. As regards to his approach to science, rather than scurrying away from it as many church leaders did, Edwards like some others, embraced it! As he went on in life, while many in the church found that science was pushing them to an impersonal view of God, Edwards went the other way. He embraced the natural world as evidence of God’s craftsmanship and design. He went on to become perhaps America’s finest philosopher and thinking as well as a mighty preacher and church leader. Wales – In Wales, revival broke out in the Church of England in 1738-1742 under the divinely inspired preaching of Howell Harris and Griffith Jones. It was during this time that George Whitefield was converted before he went to the USA to preach the same gospel there! England – Perhaps the greatest names in England were the Wesley brothers - John (1703 - 1791) and Charles (1707 - 1788)! Together they revitalised a church quickly stagnating! Open air preaching, vibrant songs and zealous sermons were their hallmarks. At the heart of their preaching and hymnody were these thoughts “Justifying faith implies, not only a divine evidence or conviction that God was in Christ, reconciling the world unto Himself, but a sure trust and confidence that Christ died for my sins, that He loved me and gave Himself for me.” You can see the reference in it's context by clicking here. Many came to faith because of them, and these people were discipled methodically. Together they founded the Methodist movement which gave birth to the Methodist denomination. The church is almost 1800 years old now. The Holy Spirit is still at work, empowering the church despite the Age of Reasoning and the ignorance of the spiritual aspects of life. That’s it for this time! That is the conclusion of our series HAHA! I hope you have enjoyed this speedy journey in the life of the Church! The story of the Church continues, and will continue until the object and source of the Church’s faith, Jesus Christ returns in glory just as He has promised to do! Thanks for listening! Come back to Partakers, where every day there is something new to encourage your walk as a Christian in the 21st century. G’day and welcome to Partakers and to our series, HAHA – Heroes and Heretics Abound. Together we are looking at the story of the church from its origins through to the Age of Reasoning in the 18th century. Last time we looked at the Protestant Reformation gathering apace in 16th century England. The main issue in the 16th century, as we saw together was “None but Christ saves” - that the Gospel is good news for all of humanity, that nobody can earn their salvation, but rather salvation is a free gift from God for all those who choose to receive it. The main issue in the 17th century however, was 'None but Christ reigns'. The Stuart monarchy promoted the 'Divine Right of Kings', the God given authority to rule country and church. James VI of Scotland became king in 1567, and tried to re-establish the Episcopalian system, undermining the Presbyterian system. In 1603, he became the King of England as well and became James I of England. The Scots never accepted his authority over the church and fought to maintain religious freedom. James and his son Charles harassed the Puritans and drove many out of the country to Holland. King James I however did authorise a new translation of the Bible – what we today know as the King James Version or Authorised Version. National Covenant - The Archbishop of Canterbury tried to impose a new system of Church Government (Episcopalian) on Scotland, but the Scots rejected this and many signed a national covenant to maintain the freedom of the Presbyterian Church. 1638 - The General Assembly of the Church to establish who was head. The people led by Henderson accepted the king as king, but not as the head of the church. War broke out and the Scots, under General Alexander Leslie, defeated Charles in 1640. 1643 - Both the English and Scottish Parliaments signed a Covenant binding themselves to seek the reformation of religion along Reformed lines. 1643-49 - The Westminster Assembly of divines met to establish a basis for a united church in Britain. The Westminster Confession of Faith became the statement of faith for the Presbyterian Church. The Puritans - Many Christians wanted greater reformation in the Church, following Calvin's model of Church Government and worship. Some separated from the Church of England altogether because they were considered still to be too closely attached with the Roman Catholic Church. . They formed distinctive groups embracing a greater purity of worship, doctrine and personal piety. Some went so far as to totally separate themselves from all other Christians and started autonomous local gatherings of believers. These independent churches were the beginning of the Congregational Church. The Separatists - These Separatists were persecuted by both the Roman Catholic & Protestant churches, and many were driven out of England to Holland were there was great religious freedom. They were hounded out of England by King James I and then by King Charles. Many left for Holland. However in 1620, some returned to England and left for America (New England) on the Mayflower. They wanted a new land where they could worship God with total freedom and virtually establish His kingdom on earth. By 1643 some 20,000 had arrived resulting in America's origins being deeply religious. The Baptists - Some of these Puritans maintained believers baptism by immersion was also essential. This started John Smyth in an independent church in Holland. A remnant of this church returned to England, and established the first Baptist Church, resulting in over 300 churches in England by 1660. That’s it for this time! Next time in our series HAHA, we will look at the last of this series - the church in the 18th century confronted by the Age of Reason and scientific materialism! Thanks for listening! Come back to Partakers where every day there is something new to encourage your walk as a Christian in the 21st century. Reformation 3 - England Here We Come! G’day and welcome to Partakers and to our series, HAHA – Heroes and Heretics Abound. Together we are looking at the story of the church from its origins through to the Age of Reasoning in the 18th century. Last time we looked at two of the giants of the Reformation – Ulrich Zwingli and John Calvin as well as the growing persecution of the Protestants - those who embraced the Reformation! We are now in England in the early 16th century! However Protestantism had commenced earlier in the 14th century with John Wyclif who we looked at back in episode 22. Wyclif was the 'Morning Star of the English Reformation', who had a great desire to ensure that the Bible was made available to everyone in their own language. So a strong evangelical protest started with Wyclif. King Henry VIII In the late 1520s King Henry 8th as head of the Roman Catholic Church in England, broke away from the Church in Rome. He broke away because he wanted a divorce from Catherine of Aragon, which Pope Clement VII refused to accept. Earlier, in the year 1521, Clement had recognised Henry as the 'Defender of the Faith' for his writings against Martin Luther. Pope Clement VII was known for his intolerance of Protestants and his main method of evangelisation was through coercion and force if necessary. In 1531 Henry prevented the English clergy from dealing with Rome under an Act of Parliament labelling this as treason. In 1534 Henry was made the 'Supreme Head of the Church of England' by the parliament. However he remained Roman Catholic in practice and doctrine. In 1532 made Thomas Cranmer the Archbishop of Canterbury – the clerical head of the Church of England. Reformation in England however continued unabated. Thomas Cranmer was a reformer and was helped by many of the Reformers driven from Europe by the Roman Catholic attacks on the Protestants. William Tyndale translated the New Testament into English and this made a significant impact. Edward VI (1547-1553) became the king at the age of 10, and ruled for 6 years. He was well trained by Cranmer. He allowed religious freedom, and he published with the help of Cranmer, the 1st and 2nd Prayer Books. Then there was a change back again! Mary Tudor "Queen Bloody Mary" (1553-1558). Mary was a fanatical Roman Catholic and set out to re-establish the Roman Catholic Church. She put to death many bishops including Cranmer. She marred Charles V son (Spain) to bring all of Christendom under Spanish power. In 1554, she resubmitted England to Papal authority. Queen Elizabeth (1559-1603). As a daughter of Henry VIII second wife, Anne Boleyn, she was not recognised by the Pope. She was not in full agreement with the Reforming Protestants, but maintained Protestant leanings. She influenced preparation of the 39 Articles of Communion, largely prepared by Cranmer, which were less reformed as a result. In 1559, she became 'Governor of the Church of England'. She defeated the Spanish Armada, with the help of Sir Francis Drake, who were attacking in order to bring England back under Spanish and Roman Catholic control. This strengthened the Protestant cause in England. The main issue in the 14th to 16th centuries, as we have seen was 'None but Christ saves'. That is, that the Gospel is good news for all of humanity. Nobody can earn their salvation, but rather salvation is a free gift from God for all those who choose to receive it. This is a far cry from the excesses of Church dogma to date and closer to the teachings of Jesus Christ and the early church. That’s it for this time! Next time in our series HAHA, we will look at the church in the 17th century continuing the reformation of theology and Christian practise! G’day and welcome to Partakers and to our series, HAHA – Heroes and Heretics Abound. Together we are looking at the story of the church from its origins through to the Age of Reasoning in the 18th century. Last time we looked at one of the giants of the Reformation – Martin Luther! Today we continue with the Protestant Reformation by looking briefly at two other giants of that time – the Swiss reformer, Ulrich Zwingli and the French Reformer, John Calvin. Zwingli was a Swiss reformer independent of Luther who was greatly influenced strongly by the teachings of Erasmus. He was born during a period of time when Swiss national patriotism was emerging. After studying humanities before taking on the role of pastor in a church in Glarus and later in Einsiedeln. It was in 1518 that Zwingli became pastor of Grossmunster in Zurich. Here he preached about reforming the Roman Catholic church. He was particularly critical of fasting during Lent, church hierarchy, clerical celibacy and the use of image in worship. In 1525, he produced a new liturgy to replace the Roman Catholic liturgy. These ideas soon came to the attention of Martin Luther and other reformers. When they met, they did agree on many things but differed on several y matters. Zwingli taught that the Lord's Supper was purely symbolic and the elements of bread and wine did not change literally into the flesh and blood of Jesus Christ and nor did they at any point contain the real presence of Jesus Christ. His reforms went from Switzerland to France, Scotland, Hungary, Holland, Germany, England, Puritans). Zwingli was killed in 1531 during an attack by his enemies within the Roman Catholic church on a food blockade supported by him. Zwingli’s theology held the supremacy of the Bible, being the inspired word of God, over the teachings of humans such as the Church Councils and Church Fathers. Concerning baptism, Zwingli differed from the Anabaptists who promote adult baptism only. Zwingli taught that the baptism of children was valid, describing that it was symbolic of God’s covenant with the Christian, much the same as it was when God made His covenant with Abraham. He also promoted a non-Roman Catholic view of Church Government and Worship. Zwingli thought that the government was instituted by God and that they governed with divine approval. He taught that Christians were obliged to be obedient to their governments but to be disobedient only when the government acted in a manner to God’s will. Calvin went onto introduce new forms of church government and worship liturgy despite opposition from secular authorities and people of power. In his final years, Calvin continued unabatedly to promote the Reformation of the church throughout Europe. During this time he also kept busy writing commentaries and regularly preached in churches. Prime to his thinking was Augustinian teaching, leading him to propose the doctrine of predestination and the absolute sovereignty of God in salvation and damnation. While the Reformation was only in its infancy, there was intense persecution of the Reformation Protestants by the Roman Catholic Church, particularly in Spain, France and the Netherlands. Thousands of Protestants died in battle and through persecution. It was during this time that the printing press was invented and was the catalyst for the rapid promotion and distribution of these new ideas of Luther, Zwingli, Calvin and others. During this time also, we have noted that there was intense theological debate between the Reforming Protestants over such things as worship, predestination, the Lord's Supper and style of Church government. During this period, the Roman Catholic Church evangelised and rapidly gained new ground and more than made up for the losses to Protestantism. 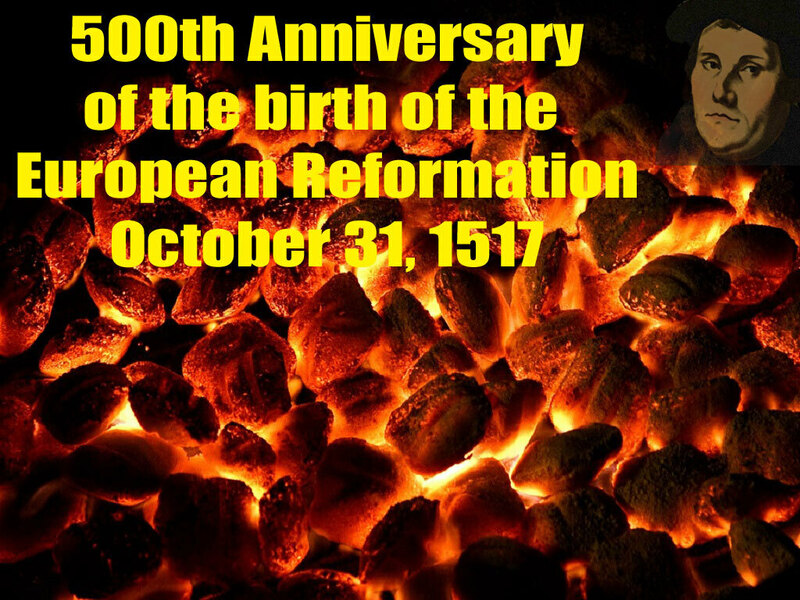 The Roman Catholic church did respond with a Counter Reformation. Commencing with the Council of Trent and the beginning of the Jesuits, these were designed to counter the Reformation movement. The majority of Northern Europe became Protestant, while Central Europe sank into deep conflict. In the mid-1500's many Protestant Christians rejected both the Roman Catholic Church, and Lutheranism for not having gone far enough. They stressed personal discipleship; a daily walk with God; a principle of love and pacifism; the Church as a family not an organisation; adult baptism; congregational Church government; and the separation of Church and State, The spread through Europe and were intensely persecuted by both the Roman Catholic Church and other Protestants resulting in many deaths. One of their leaders was Menno Simons (1496-1561), whose group the Mennonites, are still functioning today. That’s it for this time! Next time in our series HAHA, we will look at the Reformation gathering pace - this time in England!